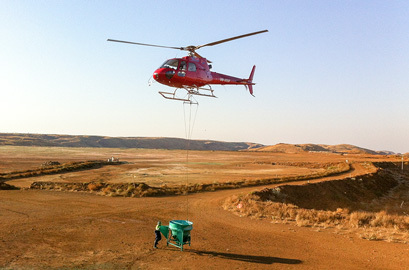 Gluon Aerial services and Rainstorms Heli-Bucket applications target isolated or difficult access sites and sites requiring important environmental rehabilitation (sensitive ecological areas for protection and connected area rehabilitation). Rainstorm aerial applications are a fast and efficient method to close off out of reach areas for long term dust suppression. If the location is suitable for fixed wing applications, air tractors can apply Gluon over site areas. 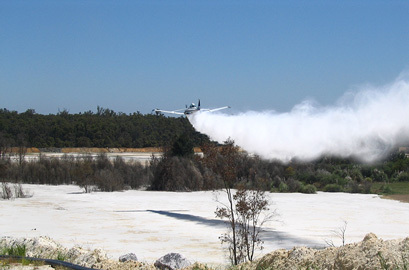 Gluon Aerial Applications are extremely well suited to Tailings facilities Dust Control. Gluon provides essential dust remediation for environmental and community for remediation sites. Aerial services are ideal for difficult access sites / untrafficable materials / topography.